WASHINGTON (CNS) -- For nearly 130 years, the Missionary Benedictine Sisters have made it their mission to spread the Gospel, reaching 19 countries and five continents. However, in recent years, the sisters have been expanding their mission to reach cyberspace. "It was because of our development office that we had a need to expand our ministry via cyberspace," said Sister Kevin Hermsen, the development director at the Immaculata Monastery in Norfolk, Nebraska. "We are following the direction of the Holy Father regarding evangelizing using the forms of media that are available today." The sisters at Immaculata Monastery have been able to use social media as a way to evangelize both nationally and globally. "We are an international missionary congregation," said Mackenzie Clayton, the monastery's media coordinator. "We want to share the word of God around the world. We have contact with sisters around the world and they give us updates on situations that are going on." The Immaculata Monastery in Norfolk is the location of the order's province headquarters, but sisters are stationed in countries across the globe -- including Uganda, the Philippines, Spain and Argentina. "We are a missionary benediction and social media helps us build that missionary benediction all over the world -- not just in Norfolk, Nebraska," said Sister Fidelis Marie Lanowich, who with others at the monastery spoke to Catholic News Service in a telephone interview. As a way to get their message out globally, the Missionary Benedictine Sisters created a website to interact with those outside of the monastery -- www.mbsmissionaries.org. 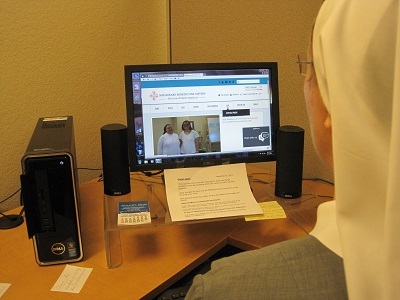 One of the ways that people like to interact with the sisters, according to Sister Kevin, is through their website's "Adopt a Sister" program, which allows people to send in prayer requests. "The 'Adopt a Sister' program is starting to take off," said Sister Kevin. "Knowing the name of the sister that is praying for you is a good way to stay in contact and create an interaction. It is heartwarming to know there is a sister that is praying just for you. People have come to know us through the social media we promote." The website provides information about the order's history and current events and also provides links to the sisters' Facebook, Twitter, Pinterest and YouTube pages as well as their blog. According to Sister Rita Marie Tofflemire, the younger women in the monastery are not the only ones who have taken to social media -- it has become a helpful tool for women all of ages. "We have an 86-year-old sister who is on Facebook all the time just to evangelize and reach out to people. She calls it 'faithbook,'" said Sister Rita Marie. As a part of their website, the sisters have created a blog where they share with readers what occurs in their daily lives in the monastery. "Our way to promote vocations is by sharing our lives with others so they can see the joy in our lives," said Sister Fidelis Marie. "Being able to express our lives through pictures and stories gives women an avenue to see our life before they come." One of the misconceptions that the sisters aim to break through the use of social media is to demonstrate that their life is not unlike life for other people. "Religious life is not stiff and boring," said Sister Kevin. "We really do interact and have good relationships with each other like a family would."